“Keeping it local.” This is one practice we continually strive to accomplish here at Standing Stone Brewing Company. While we proudly serve our very own beef and lamb, we don’t currently raise pigs at “One Mile Farm.” As such, we’ve partnered with local pig farm, RA Farms, to locally source the pork that we currently serve on our menu. 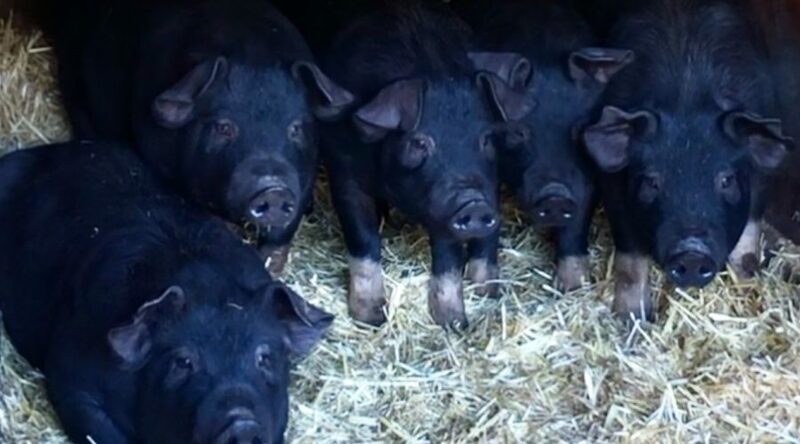 These pigs are raised in the most humane and environmentally friendly manner possible. 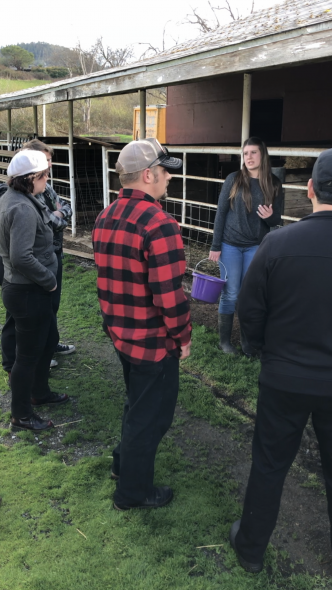 Not only that, the most interesting aspect of partnering with this farm is the fact that it’s founders are two teenagers who are taking steps to make a positive difference in our local community. Meet Alyson Scheffler and her brother Reagan. “My name is Alyson Scheffler, and my brother Reagan and I are the owners of RA Farms. I am a senior at Eagle Point High School and Reagan is a sophomore. We both became involved in agriculture through 4-H and FFA programs here in the valley. However, our love of agriculture started far before we owned our first hog. We are sixth-generation hog farmers here in America. Our great-great-great grandparents moved their families to the United States from Switzerland and Germany, and began raising hogs. The first three generations had traditional farms: hogs, cows, chickens, crops, a little bit of everything. In the late 60’s and early 70’s, our grandparents expanded their hog operation where they raised 2,000 hogs per year, taking them through their entire life cycle. Though my father raised hogs through 4-H and FFA, our immediate family has moved away from farming, compared to past generations. Our parents are not involved in agricultural careers, and my grandparents also retired from farming. We have made multiple trips to visit my Great Grandma Betty on the family farm in Minnesota, which was established in 1874. We got to see the barn and the same house my grandpa grew up in. Seeing this heritage inspired my brother and I. To maintain our connection and the value of a farm upbringing, my brother and I began raising hogs through 4-H. Our business, RA Farms, began in 2011 after my first year of raising a 4-H hog to sell at the Jackson County Fair. After raising our first hog, we decided that this was something we would do year-round. My dad brought up the idea of raising butcher hogs in the off-season, and we raised our first two hogs in the winter of 2011. 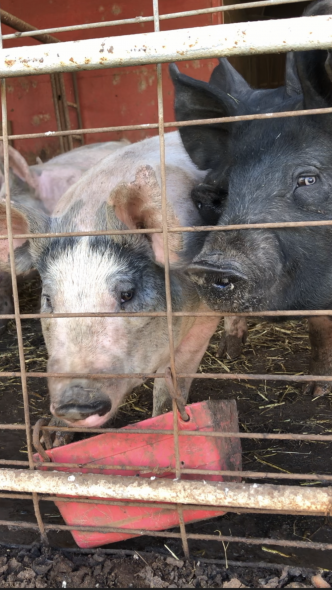 We have been raising and selling hogs for eight years now, and it has grown from raising just two animals per year to 40. The amount of animals we raise per year depends on the demand; we usually base it off of how much pork restaurants and individuals in the community need. 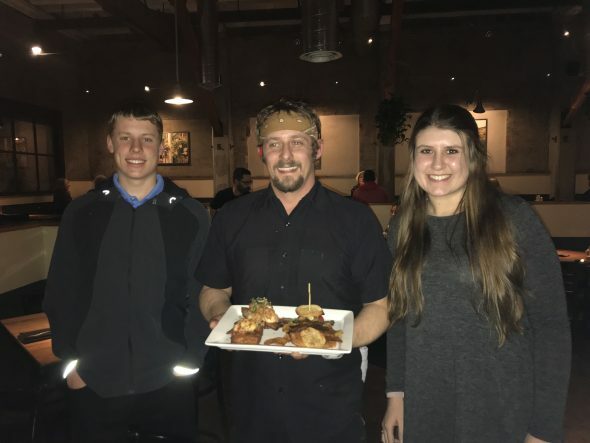 This business has become hugely successful for us in the past couple of years because of the farm-to-table practice that many restaurants are now adopting. Humanely & sustainably raised pigs, RA Farms. People want to know where their food is coming from, who’s raising it, how it’s treated and what it is eating. Consumers and restaurants count on us, and we don’t take this responsibility lightly. 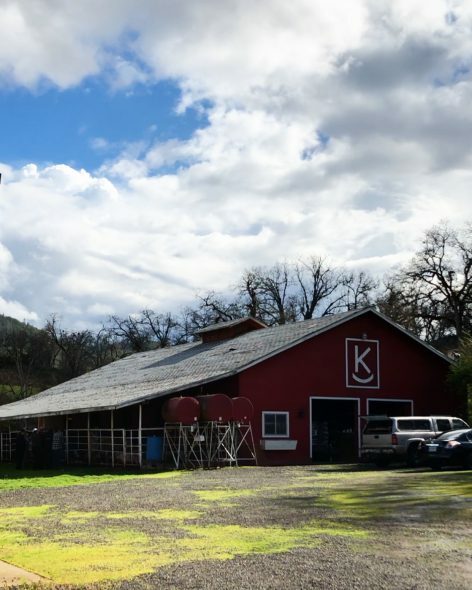 We focus on the local aspect as much as we can: we source all litters of pigs as close to home as possible, and we buy feed that was milled within the state of Oregon. Keeping everything in our business local is a large part of our business marketing strategy & mission. Alyson gives a tour of RA Farms to Standing Stone employees. Standing Stone will continue to partner with local farms like the Schefflers’ in order to accomplish our mission of supporting local businesses, as well as maintaining sustainability and environmental awareness to build a better future for tomorrow. When you choose to dine with us, you are joining us on this mission. Thank you, to our loyal customers, for your continued support. Stay tuned for an upcoming video feature that takes a closer look at our partnership with RA Farms. The frost is on the pumpkin, and winter is upon us. 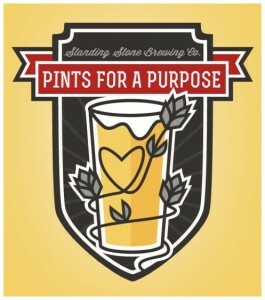 At Standing Stone Brewing Company that means that it is time for Pints for a Purpose, our annual season-of-giving, where we choose five local non-profit organizations to each benefit from a night of glass-raising, awareness-raising and fund-raising for a good cause. The first of our Pints for a Purpose benefit evenings will be on Tuesday November 27. For every beer that we sell that that evening, $2 will be donated to The Bee Girl Organization. The Bee Girl Organization is a nonprofit with a mission to educate and inspire communities to conserve bees, their flowers, and our food. The Bee Girl Organization will use Pints for a Purpose funding toward running their two biggest projects: “Kids & Bees”, an educational bee-centered summer camp aimed at 3rd graders, and “Regenerative Bee Habitat”, which includes pollinator habitat research and floral preference surveys to develop seed mixes for both farmers and gardeners that benefit all of our bees. While preparing to write this Blog post I visited The Bee Girl Organization website https://www.beegirl.org/. I found such a wealth of information there! There is information about beekeeping, about planting flowers that bees love, about habitat restoration and about teaching kids to love bees and honey. I learned that honey is not ‘bee puke.’ “It’s flower nectar, which worker honey bees collect from flowers. They store it in their “honey crop.” This is like a chipmunk cheek. The bee stores the honey, like a chipmunk stores nuts and seeds for its nest. When the worker bee arrives back at the hive, she passes the nectar off to another bee, through their proboscises. The bee inside the hive puts it into a honey comb “cell.” It’s still not honey, though. Bees add enzymes to the nectar, and evaporate over 80% of the moisture off of the nectar (using their wings as a fan). When it’s the right consistency, the bees seal it with wax”. This is a quote from a lesson plan aimed at teaching elementary school students to appreciate bees and honey. Promoting knowledge and appreciation of the value and the work of bees is something that SSBC supports completely. Bees pollinate our plants to insure productivity and bio-diversity. Healthy plant communities are crucial to the health of our livestock and to the basic local ingredients in our food and beer. Another win-win-win situation. Please plan to come on out and join us on Tuesday, November 27 between 5 and 10 pm. Enjoy some delicious, locally grown and produced food and raise a pint of local brew to The Bee Girl Organization. Another Park Clean-Up in the Books! APRC formed this program due to the vast amount of local land requiring general maintenance; It manages 17 parks, 48 miles of trails, a golf course, multiple open spaces and numerous recreational facilities. The organization looks to Ashland individuals, neighborhood groups and businesses to help. 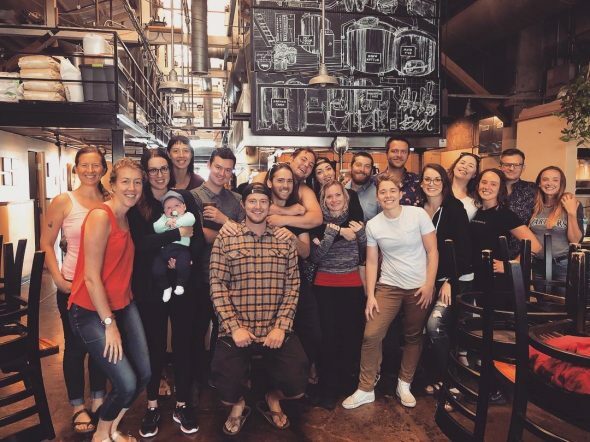 Cue our amazing team here at Standing Stone Brewing Company (SSBC)! SSBC adopted a small park called Calle Guanajuato about three years ago. Located next to Ashland Creek and behind the shops on the Plaza, this particular park is open from dawn until dusk and is dog friendly. Although small, it still sees a lot of foot traffic due to its location downtown and, as such, trash and debris tend to accumulate regularly. 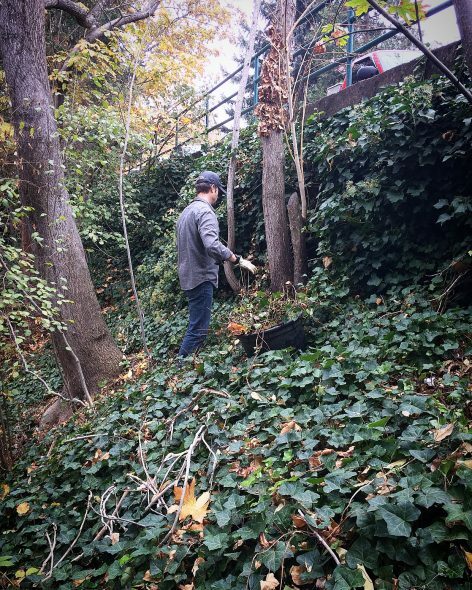 On a quartely basis, SSBC “rallies the troops” for a day of weeding, trash collection and overall grooming of the area. APRC provides training as well as all of the necessary tools to get the job done. Not only does our beautiful city benefit from this volunteer work, but our team also walks with away with a sense of pride, comaraderie and accomplishment; a win-win for all! With the Fall clean-up now behind us, SSBC will once again converge on the Calle this winter. Until then, if you happen to see trash or clutter, do us all a favor and collect it! For more information on how to adopt a local park, contact Ashland Parks & Recreation Volunteer & Event Coordinator Lori Ainsworth at 541.552.2264 or by email. 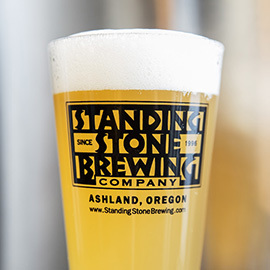 “At Standing Stone, we work to operate our restaurant and brewery in a way that protects and restores the environment, and supports the health and happiness of our community, guests and employees.” This is our mission statement, and it influences our business practices and our commitment to social responsibility. 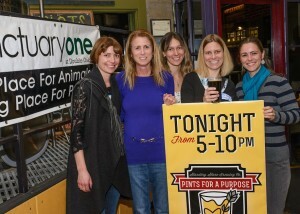 One example of this is Pints for a Purpose, Standing Stone Brewing Company’s (SSBC) annual “season of giving” program. 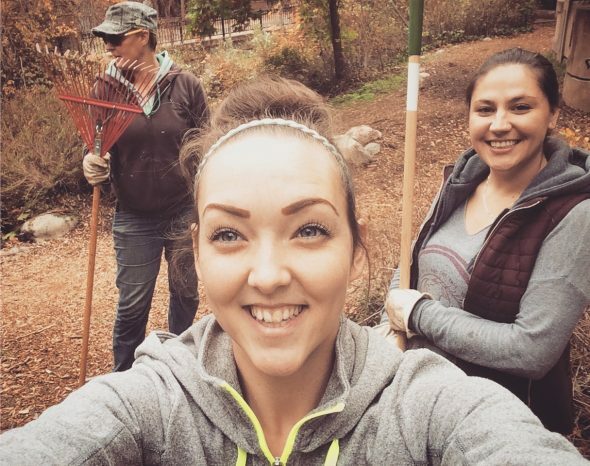 Once a month on a Tuesday evening, from November through March, SSBC hosts a Rogue Valley non-profit organization; these participating groups are selected by Standing Stone employees. Each of these chosen organizations work locally to contribute to many of the same core values and concerns of our business, our staff and our clientele: education, environmental sustainability, community and local food production. The way it works? Each organization invites its staff, volunteers, friends and supporters to come down to Standing Stone on its particular benefit night for libations, refreshments and camaraderie. SSBC donates $2 for each pint of beer sold that evening to the participating organization. Last year, we raised over $2,000 for these local non-profits. Pints for a Purpose is a win-win arrangement; Standing Stone has the opportunity to host a lively, fun-filled evening for our community and friends, the benefiting groups receive publicity, networking opportunities and much-needed funding, and guests enjoy fabulous food, company and the joy of drinking beer for a good cause. So, be sure to mark your calendars. Invite your friends. Plan to come out for Pints for a Purpose and drink beer (responsibly, of course!) for a great cause. 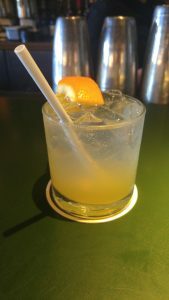 In the thirty seconds between picking your favorite bar stool and the bartender noticing you, it’s a frantic scramble in your brain to come up with an exotic and fun cocktail. For those that want to try something fresh but aren’t sure where to start, we here at Standing Stone created several new specialties to delight your taste buds. Our lineup begins with the Wild Roots Marion Drop, invented by the charismatic Jacob Nunes. One of the best qualities about this martini is its simplicity; Wild Roots Marionberry vodka, fresh lemon and pineapple juice, and garnished with a lemon for zest. The pineapple doesn’t overpower the marion berry and the tropical undertone sets the mood for a flirty and fun drink. One of the concoctions that took me completely by surprise, was the Oregon Orange Oasis, also created by Jacob. More complicated than the Marion Drop, it’s a charming blend of Immortal Spirits State of Jefferson Rum, house made Orange Soda, Cointreau and a wheel of orange. The first taste is likened to a Creamsicle before transitioning to a smooth finish as the whisky rounds off the sweetness. Overall, the kid in you that yearns to hear the nostalgic jingle of the ice cream truck, will rejoice as the bar tender hands you the mature beverage masquerading as summertime bliss. Craving the taste of Sangria? Put down the Carlo Rossi and sprite for a more elevated and sophisticated feel with our select wines on tap, fresh fruit and brandy. The brandy adds a solid backbone to the tangy wine, lifting our beverage beyond its vineyard origins. If mint is your thing (and I’m sure you know where I’m going with this) never fear: the classic Mojito is now available created by the talented Gina. A blend of Four Spirits Spiced Rum, fresh lime juice, simple syrup and mint from our rooftop garden, the hit of this drink is the slight spice from the rum that packs a punch without taking away from the crisp flavor of the M ojito. Deviating away from our cocktails, I must pay tribute to the newcomer available on tap: the Summer Squeeze which derives from the ingenuity of our faithful brewer Larry. Tangy with a dash of sweetness, it’s the perfect refresher for a hot day when the AC breaks down and you’re feeling defeated by the sun’s rays. What makes this sour so unique is the amount of grapefruit involved: one pound of grapefruit is added to every gallon of the mixture. Whether you fancy one of our exotic newcomers, or want to stick with our tried and true favorites, stop into Standing Stone this week to see what our mixologists can shake up for ya. 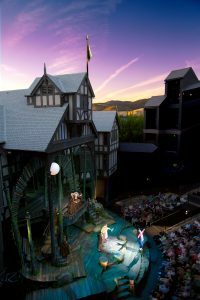 There are a couple things us Southern Oregonians think of when it comes to summer: The Oregon Shakespeare Festival and the Britt Fest. OSF and Britt provide opportunities to draw out our classy nature and enjoy shows and concerts beneath dark pines that scrape the stars. Together, they form a gateway of performance glamour in our quaint town of wayward travelers and inquisitive locals. In time though, I began to peel back the gloss that Ashland prides itself on to discover summertime jamming that flirts at the edges of stage life. With the official start of summer this week, it’s time to reveal some of the lesser known gems of the Rogue Valley. Just up the street from the trio of theatrical siblings in the shell of an abandoned church, is a performance space where fine dining and musicals of bygone eras come to life: the Cabaret Theater. While the directors like to showcase lesser known shows such as the ongoing 9 to 5 which concludes on July third, its successor, Chicago, is sure to be a provocative experience, as the ambience of the building’s stained glass windows draw you in the moment you step across the threshold. While dinner reservations typify the dining experience of the Cabaret, it’s just as fun (and a lot less pricey) to simply order appetizers and desserts. 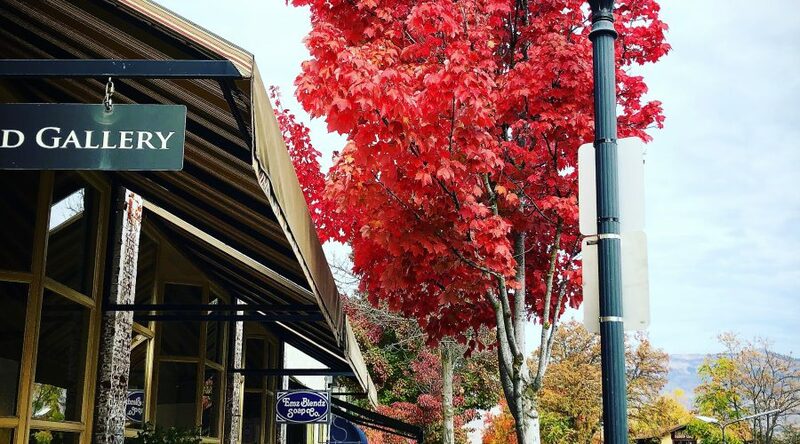 Beyond the streets, it’s no secret the Rogue valley is ripe with countless wineries beckoning folks in from the heat and humidity. Beyond the tantalizing aromas of fermented fruit, lies summer concert series spanning a range of musical genres. If you want to bask in a secret garden-esque patio while listening to valley favorites such as the Brothers Reed– then South Stage Stage Cellars is the place to be every Wednesday and Friday at 6:00 pm. Got a hankering for some food trucks as well? Swing by Del Rio Winery every Friday from 6-9 until September 23rd for a range of food including BBQ and Peruvian cuisine and a spectrum of music from soft rock to bluegrass. One more overlooked event that can’t be missed, is the Rogue Poetry Slam. A participatory event that occurs the third Tuesday of every month, aspiring poets read their original work during three rounds of a competition. If you don’t fancy yourself a writer, it’s just as much fun to be a judge: just make sure you stick around until the final round. Admission is $5 and sign ups begin at 7:30, and I guarantee you’ll laugh, cry, or be inspired during this event. 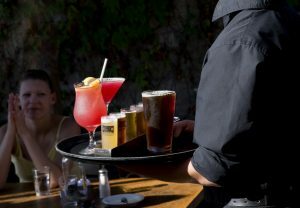 This is only a taste of the summertime events, but it’s a start in what’s sure to be a remarkable season of unbridled joy that only the Rogue Valley can bring. Cheers! Two things you should never talk about at a bar: Religion and Politics. Well, this isn’t a bar and we aren’t going to talk about religion. *Spoiler Alert* We are going to talk about politics. In a time where the American political world seems like one big giant WWF matchup-it’s good to know that behind the scenes, Republicans and Democrats in the U.S House of Representatives can still agree on one thing- Beer. 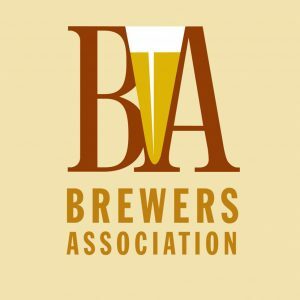 The Craft Beverage Modernization and Tax Reform Act (H.R. 2903) is now officially supported by the house majority of U.S. Representatives. Let’s talk about how exactly the American beer industry contributes to our economy. Those are some pretty outstanding numbers. No really, nice work America! Suzanne Bonamici- 1st District Oregon Rep.
Earl Blumenauer- 3rd District Oregon Rep.
Peter Defazio- 4th District Oregon Rep.
And finally a big THANK YOU to Senator Wyden, who was a primary Senate sponsor of this bill. This is just one of the many reasons that we love beer- it brings people together. Do you feel those warm fuzzies? We sure do. Let’s raise a pint to our local Government, and to Representatives all around the country for supporting U.S. Craft Beer! Thank you to everyone who came out last week for Eight Dollar Mountain. We had a packed house and they sure put on one heck of a show! We continue our Sunday Sessions this Sunday (Feb.28th), from 2-5pm, with The Brothers Reed. Brothers Phil and Aaron play a medley of folk/country/bluegrass and if your lucky, a little pop. Their tight harmonies, pretty riffs, and comically fun entertainment between songs is sure to please. Click the link to see a video of the brothers playing “Monsters In My Head“. We are excited to have The Brothers Reed play at Standing Stone Brewing Company and look forward to you coming to enjoy this FREE SHOW. We love our mid-afternoon live music and hope you do too. As always, KIDS WELCOME! As proud partners of the Oregon Brewshed Alliance, we will be hosting “A Weekend for Water”. During January 30th and 31st, $1 from every pint of I ♥ Oregon Ale will be donated to Oregon Environmental Council and the Oregon Brewshed Alliance (an Oregon Wild Alliance). Why? Why would a brewery be so interested in donating money to help keep Oregon’s rivers and lakes clean you may ask? The answer is simple; beer is 90% water and CLEAN WATER MAKES THE BEST OF CRAFT BEERS. “Since water comprises 90-95% of the liquid in your glass of beer, we need clean water to brew clean beer,” says Standing Stone brewer Larry Chase. Besides our addiction to creating great craft brews, we here at Standing Stone Brewing Company feel that as apart of our community it is our responsibility to help maintain the health of our ecosystem. By supporting great organizations like Oregon Environmental Council and Oregon Wild we can do just that. Please join us January 30th and 31st to show your support for Oregon’s clean lakes and rivers. Gifts, Growlers & Goodies, Oh My! Have you wrapped up your holiday shopping this year? Or are you the last-minute gift grabber? Either way, we’re pretty sure there’s always room left on the holiday shopping list for beer. Check out Standing Stone Brewing’s beer-themed gift ideas for 2014, guaranteed to rouse a smile and high-five from loved ones. Give the gift of beer gear! We have hats, shirts and sweatshirts in both Men’s and Women’s sizes. We also have Standing Stone One Mile Farm T-shirts for the kiddos. Add a Standing Stone logo patch to your bag or backpack, or toss it back and forth like a mini Frisbee. You can dress the whole family in matching apparel from your local craft brewery. Great craft beer deserves great glassware. Our Belgian-style 13 oz. glasses are perfect for enhancing the aroma and flavor of your favorite brew. We also have pints, half-pints and taster glasses for all forms of imbibing. Do you offer water at the holiday table, too? Grab a few half-liter or liter glass water bottles with our “Tap Into It” logo (also useful for juice, eggnog, milk for Santa…you name it!). Can’t decide what to get someone? Let them choose with a Standing Stone gift card in any amount. Cards can be used for food, beer, retail…whatever! Maybe leave a note encouraging them to take you out for a pint. Just a suggestion. What’s missing at that buffet table? Craft beer, of course! Fill up one of our liter or half-gallon bottles with any Standing Stone beer straight from the taps. To keep your brew extra cold, try our stainless steel, insulated Hydroflasks with Standing Stone’s logo. We also fill kegs to order in 5 gallon, 7.75 gallon, and 15.5 gallon sizes (24 hour notice). This wrap-ready box has it all. You’ll get a half-gallon growler with a gift certificate to come in and fill it with your favorite beer. It also includes a T-shirt of any style and size, coasters and two pints glasses. It’s about as easy as gift-giving gets! You’ll find lots of our retail items at our online store, and we offer $5 flat rate shipping for any order. You can also order by phone by calling (541) 482-2448. Or, if you live in the area, stop by the brewpub and purchase your goods in person. While you’re at it, have a pint and pat yourself on the back for having the awesome idea of giving craft beer for the holidays.